Combat scene. 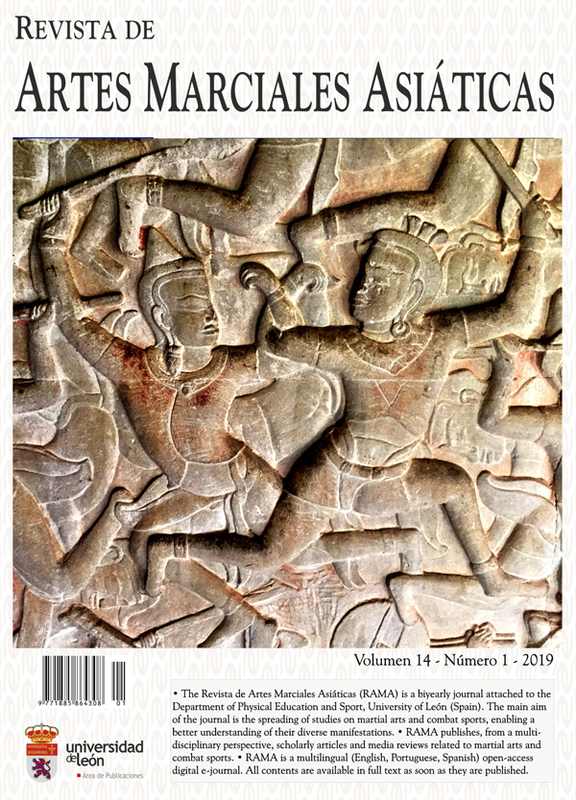 Detail of the Kurukshetra battle bas-relief, Angkor Wat temple (Cambodia), s. XII a. C. Photo courtesy of José Luis Gutiérrez García. 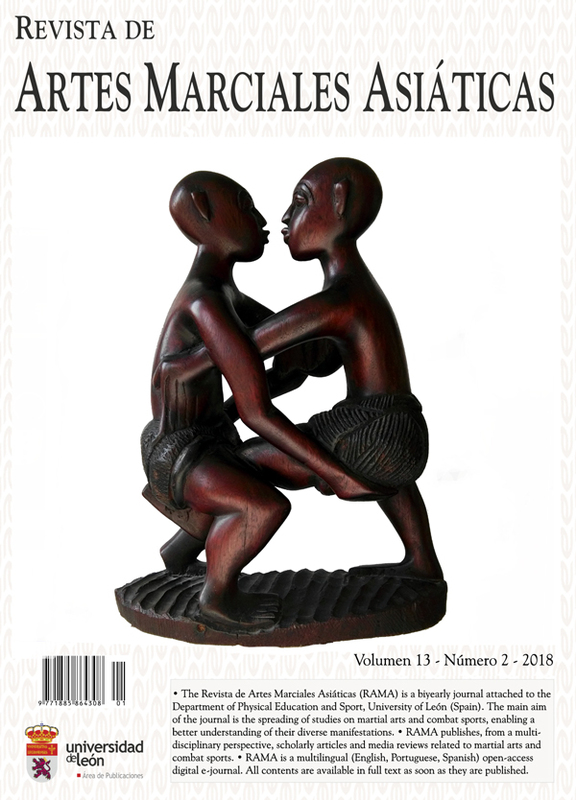 Senegalese wresting wooden sculpture. Private collection. 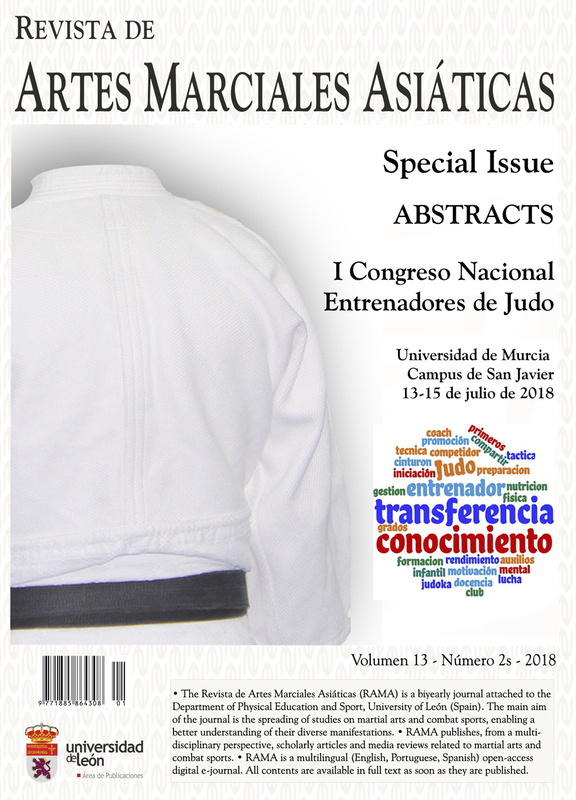 Special Issue: I Congreso Nacional de Entrenadores de Judo Abstracts, Murcia (Spain), July 13-15, 2018. Special Issue Guest Editor: Prof. Dr. Raquel Hernández-García, Head of the Organizing Team. 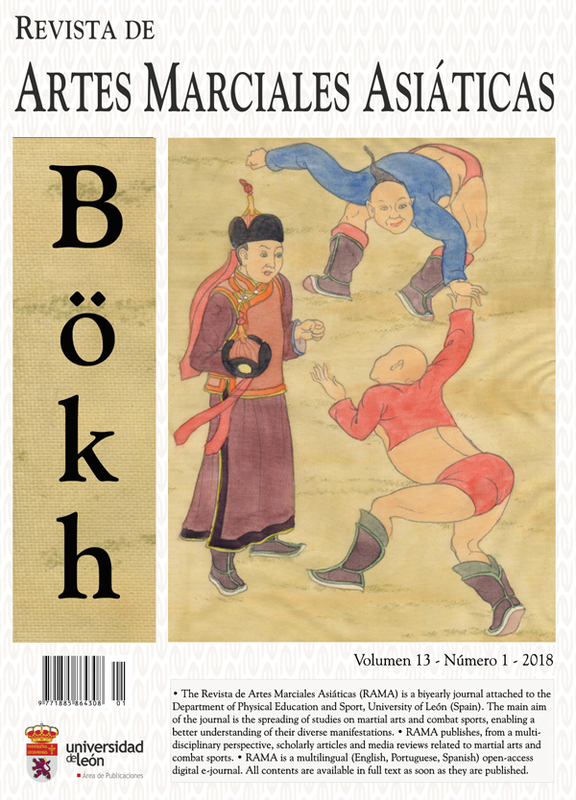 Bökh (traditional Mongolian wrestling). 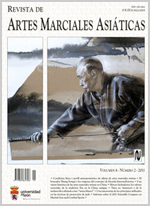 Painting on silk. 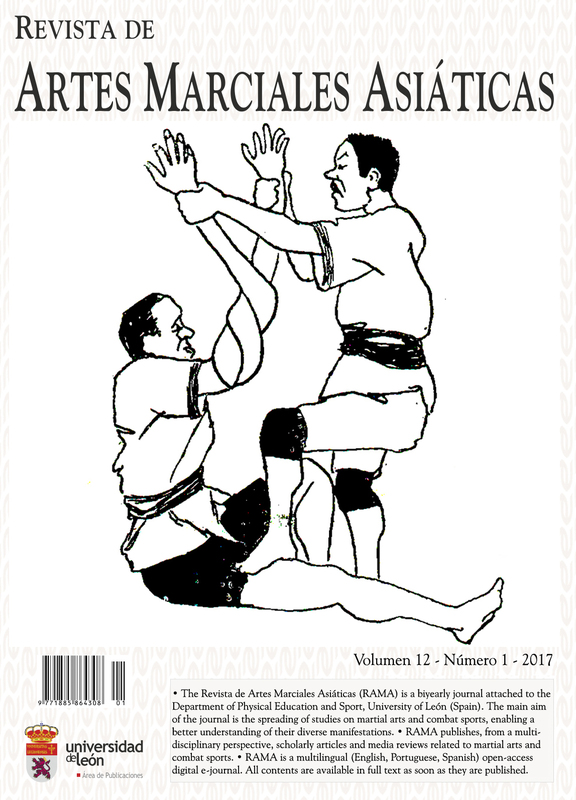 Leonese Wrestling technique "Cadrilada" (old style grip). 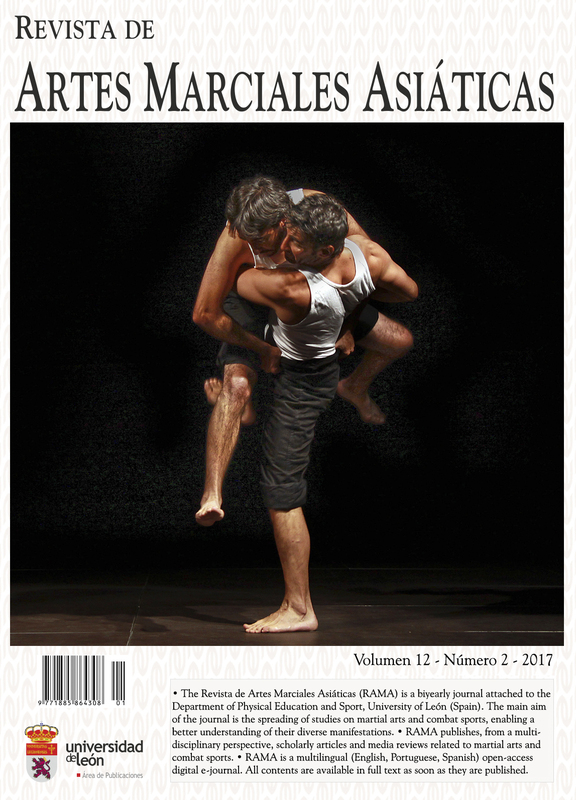 Wrestlers: Jose A. Robles Tascón and Ángel Alonso Robles Tascón. Early 20th century Jiu-jitsu caricature. Source: Cambra, J.M. (1912). El Sport en caricatura. Stadium, 21 (April 1), p. 15. 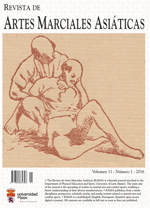 Image of the cover of a pioneering "modern judo" Spanish book, Judo y Jiu-Jitsu. 40 Lecciones prácticas de fácil interpretación. Reference: [Ungría, B.]. 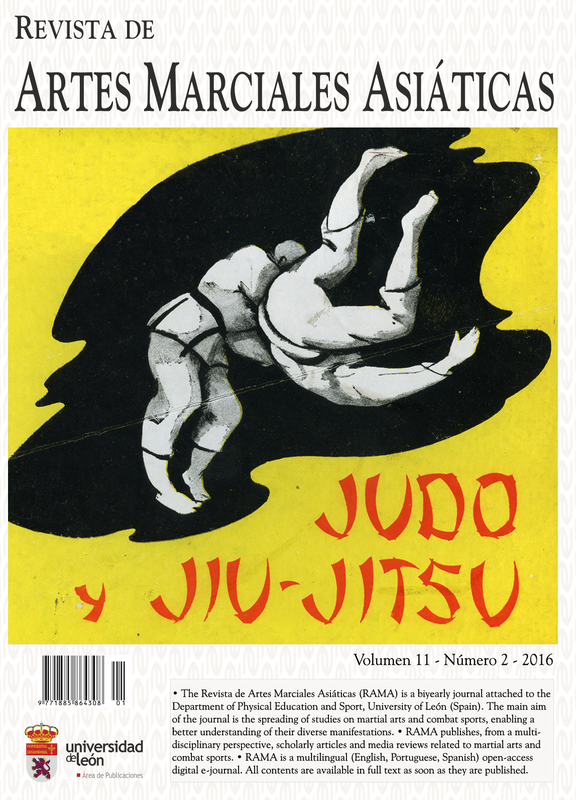 Judo y Jiu-Jitsu. 40 Lecciones prácticas de fácil interpretación. [Madrid: Gráficas Express]. 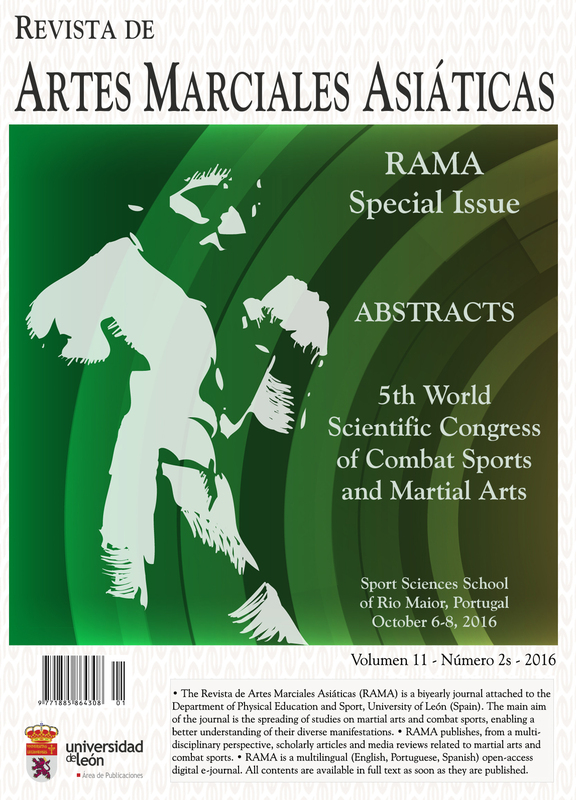 Special Issue: 5th IMACSSS World Scientific Congress Abstracts, Rio Maior (Portugal), October 6-8, 2016. 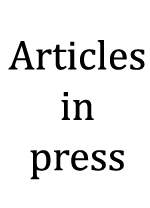 Special Issue Guest Editor: Prof. Dr. António VencesBrito, Head of the Organizing Team. Choking technique. 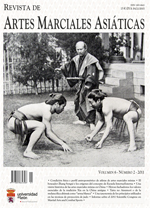 From Treatise on Ju-jutsu and its secrets, the first Asian martial arts book published in Spain. Reference: C.D.T. (Trans.) . Tratado de Ju-jutsu y sus secretos. Barcelona: La Ibérica. 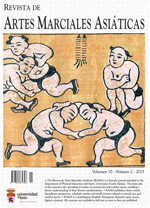 Picture of traditional wrestling (Vietnam). 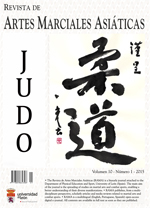 Judo, by Japanese Caligraphy teacher Michiko Hamasaki. 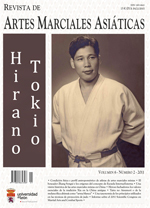 Hirano Tokio (Sumoto-city, Awaji-Shima, 1922 – Tōkyō 1993), a talented Japanese jūdō champion and charismatic jūdō instructor in Belgium, Germany and the Netherlands in the 1950s and 1960s. 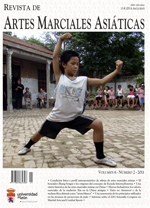 Meihuaquan (“Plum Blossom Fist [Boxing]”) at Zhu Zhai village, Puyang, Henan Province (China). Courtesy of Guodong Zhang. Source: Brownell, C. L. (1903). 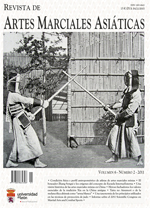 Japanese fencers and archers. In F. G. Aflalo, The Sports of the World (pp. 380-386). London; Paris; New York; Melbourne: Cassell and Company. Source: Brownell, C. L. (1903). Japanese wrestling and sleight of body. In F. G. Aflalo, The Sports of the World (pp. 92-97). London; Paris; New York; Melbourne: Cassell and Company. 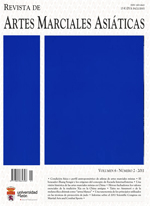 Second cover in memory of Yves Klein (April 28, 1928 - June 6, 1962), judoka and French artist, on the fiftieth anniversary of his death. 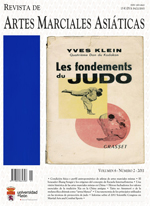 Cover in memory of Yves Klein (April 28, 1928 - June 6, 1962), judoka and French artist, on the fiftieth anniversary of his death.